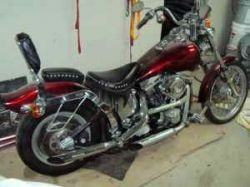 I have my 1988 Harley Davidson Softail for Sale in Pittsburgh, Pennsylvania. The 1988 Harley Softail that you see in the pictures has flashy but refined burgundy paint, lots of chrome, slash cut exhaust and a backrest that makes the passenger seat look inviting to the ladies. Cash strapped bikers should know that there is FULL FINANCING AVAILABLE for all of the very cheap $8,500.00 asking price so you get to ride, have fun and pay as you go. GO HERE TO SEE MORE! If you'd like to know more about the used Harley for sale, leave your questions and contact information in the space below provided by GoGoCycles Used Motorcycles for Sale and the owner will get back with you as soon as possible. Strike Lightning would also encourage bikers to submit a review of the 1988 Harley Davidson Softail for Sale to help potential buyers make informed decisions and to benefit the biker community as a whole. Join in and write your own page! It's easy to do. How? Simply click here to return to HARLEY DAVIDSON SOFTAIL AD INVITATION.